Searches have been periodically seeing the green “Ads” tag in the Google search results over the past couple of months, with an increase reported yesterday. Google sent a statement to The SEM Post confirming that Google is changing the color of the ads tag to green globally. Google confirmed it is rolling out globally to all users and on all devices. So we will see it on both desktop and mobile. Google also saw no change in CTRs of either organic or AdWords ads when the ad tag color was changed. So it seems the change was made purely for esthetic reasons rather than for CTR reasons, which will make many SEOs happy. 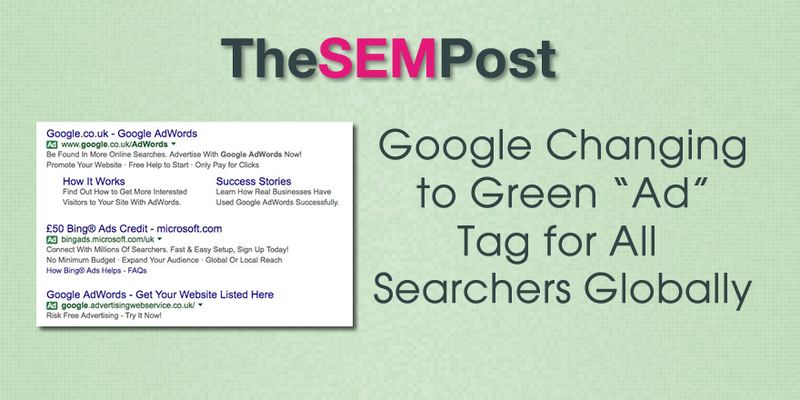 Google began testing the green tag in April, with a much wider test audience – 5% of all searches. They adjusted the color slightly the next month. Google also promotes the fact their ads are ads far more than other search engines. Bing has “Ads” in grey text while Yahoo simply ads a “Ads related to <keyword>” at the top of their ads, also in light grey text. If you aren’t seeing them yet, you may be able to see them if you use incognito mode. Personally, I still see yellow tags everywhere although I did see it in incognito mode yesterday.